Vintage Marine builds classic wooden runabouts in a traditional manner with modern materials that make our boats stronger and longer lasting. All of our new construction is built with the finest mahogany available. We use bronze and stainless steel fasteners throughout the boat. Bottoms are double plank type construction using a marine plywood inner bottom and mahogany outer. Bottoms, sides and decks are fastened with a layer of 3M 5200 sealant in between. We find that the 3M 5200 is more flexible that West epoxy type material. The benefit is a softer and quieter ride. On varnished boats, the mahogany is resawn to book match on both port and starboard sides. The result is a stunning visual experience. This method is used on all decking, covering boards and side planking. We specialize in Chris Craft style Racing Runabouts. 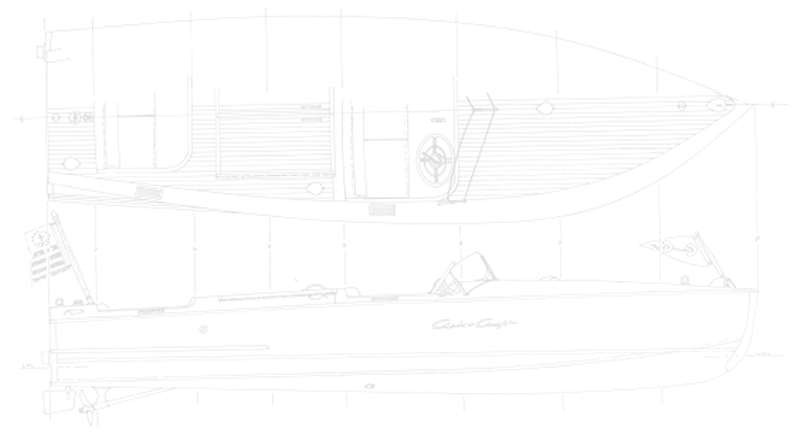 Our racers are built off the exact Chris Craft drawings to the precise shape of the original boat. Prewar and postwar versions are available, both painted and varnished like the originals. For power, we use Mercruiser inboards in a variety of horsepower ranges. These excellent engines are available in both carbureted and fuel injected versions and provide reliable turnkey use and unparalleled performance. Mercruiser service and replacement parts are widely available throughout the United States and Canada. We are not limited to Racing Runabouts - we have built raceboats and other types of runabouts. Currently under construction in our shop is a Chris Craft Custom 25' triple cockpit (mid 1930s vinatge) complete with the twin windshields.